Christians and Immunization: Exploring Religious Objections | 2014 | This video features Dr. Richard Lane, MD, MPH; Director of the Department of Public and Community Health at Liberty University addressing recent reports of religious objections to vaccination and explores the reasons behind these and how faith communities can help educate and allay fears regarding vaccines. Christians Reaching the Unreached with Vaccines in Nigeria | 2014 | This video features Dr. Daniel Gobgab, MD, MPH, Secretary General of the Christian Health Association of Nigeria describing how CHAN members reach people, especially in hard-to-reach areas, with vaccines. He also addresses how CHAN works through religious leaders to allay fears and counter misperceptions of vaccination. 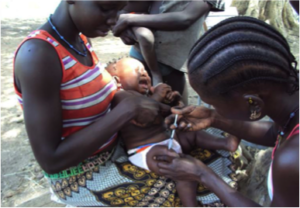 The Church and its partners, the Ministry of Health, Gavi, the Vaccine Alliance and CORE Group Ethiopia have contributed to dramatically raised immunization coverage in Gambella Regional State. Religious leaders at immunization awareness training. Photo courtesy of EECMY. 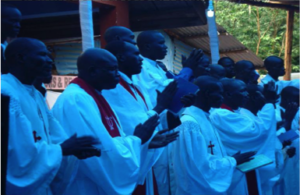 Religious leaders can be extremely helpful in encouraging healthy behaviors and reaching communities with information, especially in hard-to-reach areas in developing nations. With this in mind, the social services arm of the Ethiopian Evangelical Church Mekane Yesus (EECMY) turned to pastors and church leaders to help educate communities about immunization, and the effort paid off. “Trained pastors and church leaders played an important role in sharing key messages about the benefits of immunization, especially in inaccessible and remote areas. This created behavioral change in the community and helped create demand for vaccines in the Gambella Regional state,” said Dr. Tilahun Dafurso, Health and HIV/AIDS Program Director of EECMY’s Development and Social Services Commission (DASSC). EECMY-DASSC has been implementing diversified development interventions all over the country. Programs include livelihood development, health and HIV/AIDS, education, child and youth, gender and development and special programs such as reaching out to indigenous vulnerable groups like pastoralists and other traditional socioeconomic and cultural groups. Under Health and HIV/AIDS program EECMY-DASSC has an Expanded Program of Immunization (EPI)/vaccination. EECMY-DASSC works with the Ethiopian Ministry of Health and regional and district government health offices to provide vaccinations in 19 districts with support from Gavi, the Vaccine Alliance and the CORE Group Ethiopia. Thanks to the work of the church and its partners, immunization coverage in the Gambella Regional state rose from 25 to 60 percent on average in the last three years and decreases were seen in the rates of Whooping Cough (pertussis), diphtheria, tetanus, measles and polio in the area, according to administrative reports from the Gambella Region which have not yet been published. No cases of polio have been detected in the Gambella Regional State since 2008 due to continuous vaccination interventions and active surveillance of EECMY-DASSC in the area. A baby is immunized in an EECMY routine vaccination program. Photo courtesy of EECMY. The church organization has been providing vaccinations for more than 20 years in some of its facilities. To ensure health workers and community volunteers fully understand the immunization process, EECMY-DASSC trains government staff, community health workers and volunteers, church leaders, as well as its own staff on quality assurance and vaccine managemement practices, such as keeping vaccines cold so they remain effective. To empower advocates to encourage vaccinations, the organization provides social mobilization and advocacy strategy training in cooperation with pertinent government offices. Community and health extension workers also receive community-based surveillance training. “Even though we have seen dramatic improvement in immunization service, we still face a number of challenges, explains Dr. Dafurso. “There is a high number of children who have not received vaccinations, and the poor infrastructure in some areas affects our ability to transport vaccines which we get from the government. We also face a high rate of turnover among health professionals. In addition, we would like to improve the quality of reporting to help us make more informed decisions.” Despite these challenges, the tremendous increase in immunization coverage in recent years has gone a long way in helping Ethiopia reach the goal of giving every child the chance for a healthy start in life and to celebrate a fifth birthday and beyond. Christian Organization Delivers Life-Saving Vaccines | 2014 | A piece on the work of the Bishop Masereka Christian Foundation to provide vaccines to children and mothers in Uganda appeared on the website of the Christian publication Sojourners. Christians’ Long Support for Vaccines | 2014 | This opinion piece by CCIH Executive Director Emeritus and CCIH member Sambe Duale about support among Christians for vaccines and collaboration among Christians and Gavi, the Vaccine Alliance to reach children with lifesaving vaccines appeared in the blog section of the Christian Century. Vaccines Save Lives: How Faith Groups Can Help | 2014 | This fact sheet, produced with support from GAVI, the Vaccine Alliance, describes how vaccines save the lives of millions of children each year and the need for increased coverage to reach children who are not currently being immunized. It includes examples of faith-based organizations who are reaching children at risk of deadly diseases that can be prevented with vaccines and why the faith community can be leveraged to save even more lives. GAVI, the Vaccine Alliance and Faith Groups | Gavi, the Vaccine Alliance was launched in 2000 to fund vaccines for children in more than 70 of the world’s poorest countries. Its mission is to save children’s lives and protect health by increasing access to immunizations in the world’s poorest nations. Gavi brings together organizations involved in immunizations, including governments, foundations, international development and finance organizations and the pharmaceutical industry to work together to close the gap between children for whom immunization is a given and millions of children worldwide with no access to basic vaccines. Gavi partners with civil society organizations, including faith communities to improve access to immunizations. Engaging Faith Communities on Immunization: What’s Next? | 2013 | World Faiths Development Dialogue | Katherine Marshall | This brief summarizes and draws on the report “Faith & Immunization: Past, Present and Potential Roles of Faith-Inspired Organizations” which examines the link between faith and immunizations and explores the potential for faith groups to be more involved in this important strategy for child survival. Faith & Immunization: Past, Present and Potential Roles of Faith-Inspired Organizations | 2012 | World Faiths Development Dialogue | Lynn Aylward | This paper examines the links between faith and immunization with the goal of stimulating brainstorming as to how faith-inspired organizations (FIO), many of which are already very much involved with immunization in poor countries, could help to introduce the new vaccines. It represents a joint effort of Gavi, the Vaccine Alliance, the UN Foundation’s Shot @ Life campaign, and the World Faiths Development Dialogue. The paper reviews how FIOs are involved in direct immunization services in low-income countries and in advocacy and financing.